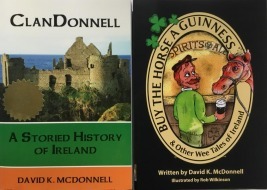 Author to tell Irish stories at the Aztec Highland Games and Celtic Festival"
The complete article is at this link at The Daily Times. You can also click the pdf link above. FARMINGTON - After visiting Ireland several times, David McDonnell was left with a couple of questions about his family and what brought them from the Emerald Isle to the United States of America. "When you go to Ireland, you wonder why anybody would ever leave," he said. He began to research the Donnell Clan and put this research into his book, "ClanDonnell: A Storied History of Ireland," which was published last year. Since the book was published, he has been touring the United States and telling Irish stories at libraries and Celtic festivals. McDonnell will present stories at the Aztec Highland Games on Oct. 4 and 5 at Riverside Park. The Aztec Highland Games and Celtic Festival is an unusual event because there are only 1,500 highland games in the country each year, said Christa Rommé, one of the organizers. Highland games consist of athletic competitions such as the caber toss. During the caber toss, athletes will throw a log as far as they can. "It's just so different and it's really exciting, even if you're not a sports fan," Rommé said. In addition to the athletics, the Aztec Highland Games features clan booths. Children can take their "clan passports" to the different booths and learn about their clan's history and Scotland. Through the highland games, Rommé was able to learn her own Scottish heritage and now she proudly wears the Douglas tartan, a clan-specific pattern, to the games. The games also feature music, highland dances and presentations by people like McDonnell.